This dish can be served as a main course or a salad. Clean the salad and spin dry. Halve the pomegrante and repeatedly hit the back of the peel until the seeds fall out. To prepare the salad dressing, place the soya milk, balsamic vinegar and the grated horseradish into a shaker and use a hand blender to purée the mixture. Add the oil to the mixture by trickling it and add until the consistency is creamy. Season with salt and pepper. Deep-fry the Schnitzel in a pan with some oil for frying until golden brown. Slice into strips. 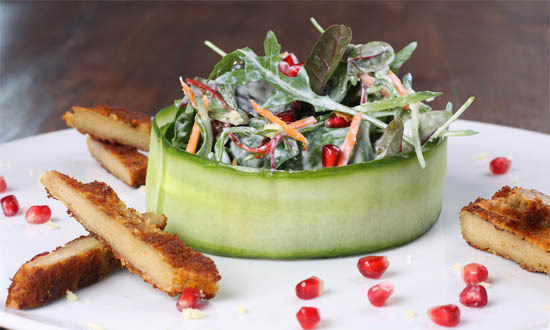 Add the salad to a bowl with some horseradish creme and pomegranate seeds, prepare a plate with the salat and add the warm strips of Schnitzel by decorating the plate. Scatter some cream and pomegranate seeds around the plate and sprinkle some coarsely grated horseradish over the dish. A tip of ours: To make sure you get a crispy coating, the schnitzel needs to deep-fry at around 160°. Once the wooden cooking spoon doesn’t cause any bubbles, you’ve got the right temperature. We recommend mixing some alba oil into the fat, so that you get a much more buttery taste.